Description: Calculate N, Q, S, Dia, or y/D for partially full pipes using Manning's Equation in English or Metric units. The program also computes the corresponding velocity. 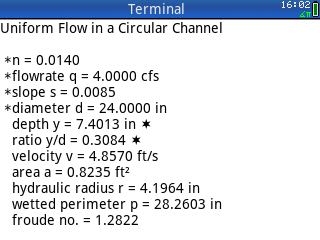 The depth of flow ratio, y/D, is solved by numerical analysis using the secant method. Where there are two solutions, only the first solution between 0 < y/D < 0.9381 is reported. When solving for the diameter, the calculated diameter and diameter rounded to a standard size are given. This program is a conversion of an old FORTRAN program that was printed in Schaum’s Solved Problems in Fluid Mechanics & Hydraulics, 1989.